So here’s a post that’s sat in my drafts for nearly a month, waiting for me to fiddle with photos etc. But there was too much for one post anyway, so here is the first instalment of my witterings about the London MCM Expo (MCM = Movie Comic Media). Those of you who used to grace my Writeous Indignation blog may recall I went to the May Expo, and missed seeing the cast of Stargate Universe due to a late train and no timetable for the shows (gnashes teeth at memory). Techie Husband and I go for the sci-fi and movies, Arty Daughter goes there for the – er, art. And Constructo Boy goes along for anything related to Dr.Who and Star Wars. Arty Daughter brought along her best friend this time (we’ll call her K the Cat – you’ll see why in a mo), because she has infected her with the Manga Madness too. Poor girl. They had a fantastic time and dressed up, because this is The Thing To Do. 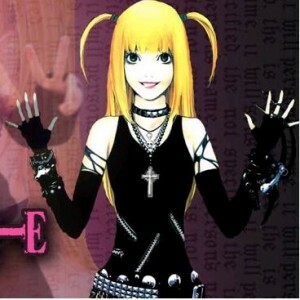 K was…a cat, kind of, and Arty Daughter went along dressed as Misa from Deathnote. 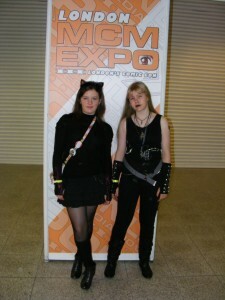 Arty Daughter (right) as Misa, and K the Cat. This time we made sure we were there early, so TH and I caught the interviews we wanted to. Haven, Eureka, Warehouse 13…more on them soon.